Welcome to Autumn, it’s fall, y’all! (I can say that, I am from Louisiana. It’s sort of like when I lived up North and said “you guys” all of the time.) There is something about the season changing; the fall weather, and beautiful Autumn leaves that get’s me excited about the changes that come with it. 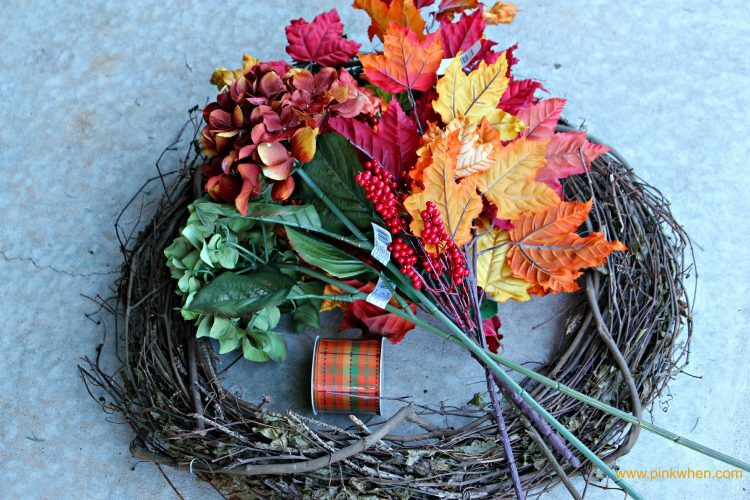 I love to decorate with the seasonal change, and this year I made a beautiful Autumn Wreath to share with you. Believe it or not, I didn’t use glue, wire, or anything you don’t already have in possession at home. The first thing I did to make this wreath was take my form and add in my autumn leaves. I wanted to share the beautiful fall colors and make this the base for my wreath. I worked the long stems into the wreath form and then used my snippers to cut the extra length. After I made the base of my wreath with the leaves, I then took my berries and did the same. I worked them into the wreath form and around the leaves and placed them exactly where I wanted. After placement, I again took the snippers and cut the remaining stems. Once the berries were on, I added in the hydrangea, and did as before. Believe it or not, working these in without the wire works well when you are using this wreath form like I am showing. They stay in place very well. After taking all of the pictures with the wreath I decided there was another little touch I would like to add. Remember the Spring/Summer Hydrangea Monogrammed wreath made a few months ago? Since I was taking it down, I decided to use the monogram and place it on this wreath. I think the monogram goes well with the colors and gives it that special personalization. What do you think? I LOVE it. If you like this wreath as much as I do, make sure to hover over the picture and PIN it! I hope you liked this quick tutorial. Let’s all welcome the changes to our trees, the autumn leaves, and the new season upon us. Happy Autumn. Make sure to follow me on Pinterest and see what else I am up to! 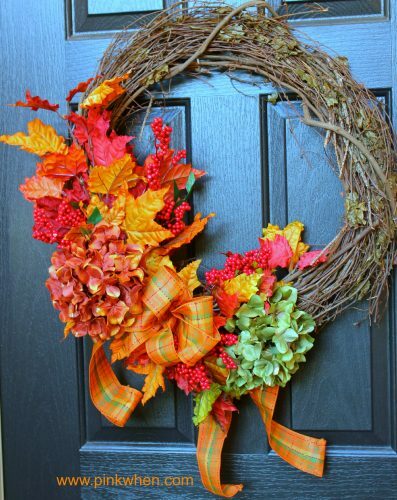 Jennifer your Fall wreath is so pretty! 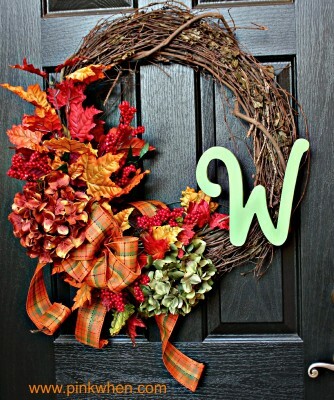 Love the leaves of course, but it’s the W that makes it completely perfect! Very nice my friend. Thanks Therese! I really love the way the W just made the colors pop. My daughter wants you to know that it’s beautiful. She’s a bit of a wreath expert – her words. I say “you guys” all of the time! I have to stop! Awe, tell Princess Scarlet I said thank you, and “you guys” is like “y”all” down here. It’s just part of the vocabulary! This looks easy!! And love the color leaves, it really stands out! This is a lovely wreath! Very festive. I can’t believe it only takes 15 mins to put together! Thanks so much. Yes, it’s quick!! That’s really cute and it actually looks easy! I think “ya’ll” all the time, but I never say it out loud. I’m in southern Illinois, so I think I’m on the bubble for being far enough south! LOL I also just moved into a new house and I totally need a wreath for my door so this project is happening!! Thanks for linking up to #LOBS! Awesome Angela! I was in Southern Illinois last year, very pretty country! I was there to pick up our lab Ranger from Siever’s Retrievers. They were in Meppin. It was BEAUTIFUL!! This gives me inspiration for my own fall wreath. I’m hoping to get one made this weekend. The monogram really gives it a personalized feel. I think even *I* can handle this one 😉 Thanks for sharing with us at #LOBS!! What a beautiful wreath! I love the addition of the initial, it finishes it off beautifully.